The event attracted nearly 300 attendees from 27 countries, including importers, U.S. manufacturers, wholesalers, offshore and service suppliers, as well as non-governmental organizations and government partners. Highlights included an in-depth discussion on financial and economic trends led by economist Win Thin, global head of emerging markets strategy at Brown Brothers Harriman. Mary Kelly, author of “Master Your World: Executive Leadership Strategies and 15 Ways to Grow Your Business in any Economy”, led a discussion on leadership, productivity, communication and business growth. IWPA immediate past president JoAnn Gillebaard Keller of Holland Southwest International passed a symbolic gavel to new incoming president Caroline McIlvain of J. Gibson McIlvain Co.
Alan Futscher of CDC Distributors Inc.; Gregg Wilkinson of Clarke Veneers & Plywood, and John Barber of Benchmark International were welcomed as new board members. The 2019 World of Wood is scheduled for Apr. 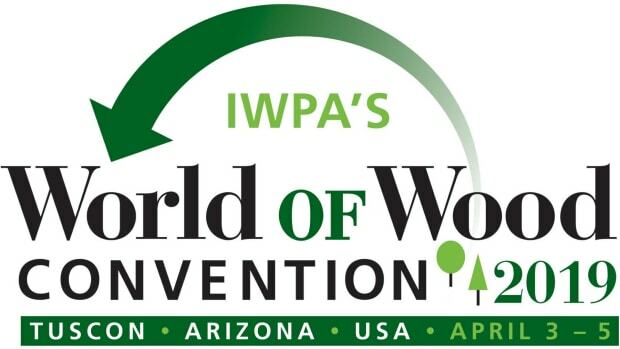 3-5, 2019, in Tucson, Ariz. For more, visit www.iwpawood.org.